Whether it’s expansion or business acquisition, at some point your business will face the need for a migration to a newer system. Administrators discover quickly that there is a smooth approach and a chaotic approach to initiating this process. Unfortunately most don’t discover the mistakes until they are facing them. When prepping your data, whether it be raw files, via a portal, or some other custom integration, there are many factors to take into account. Some will have direct implications on how the data is transposed, while others will simply result in failure of the migration. By following these 6 points, you will determine if your system migration turns out dreamy or downright dismal. 1. Know what you want, and understand what you have. As an administrator or manager, having a clear understanding of your business needs is helpful when designing your new system. Addressing specifics such as what new functions should the system provide and which need to carry over from the old system is the first step to conducting a smooth system migration. Also, how much time and funds are available? Don’t underestimate the importance of this introductory stage. Preparation and communication are essential as business administrators and the project manager establish a clear understanding of user mapping. For example, how will the IDs of the existing system map to the new IDs on the Salesforce platform? Revisit your existing profiles, page layouts, and organization’s default security settings. Take the time to verify that the users are set to their respective groups, and have proper restrictions. By knowing what you want and understanding what you have, you can make informed decisions on how best to sort through existing data to carry over to the new system. 2. Don’t toss out all of the old to make room for the new. As tempting as it may be to shut things down and throw things out in anticipation of the move, be careful about closing off licensing access and installed applications. If you’re migrating from one Salesforce instance to another, leave a couple of licenses active in the old instance for a few months after the cut over date. This will be a lifesaver if you run into issues or need to investigate why something is not functioning properly in the new instance. When it comes to apps, it’s much like moving to a new place. You wouldn’t haul a box of old, ill-fitting clothes into a new home, and the same concept applies to installed apps. At this stage, the value of basic housekeeping is deceptively critical. Keeping licensing open for future use and establishing the pertinence of existing applications optimizes the chance of a smooth system migration. 3. Determine how much space you need — before you need it. Be mindful of the space you are consuming, especially if migrating from one Salesforce instance to another. They may not have the same space options, and you might have to go back to your Salesforce rep if you need the additional space. To save time and money, it’s best to get ahead of this scenario. If you opt to size down, you must identify the consequences of that reduced space. Will it run slower? Will it limit what you can store? 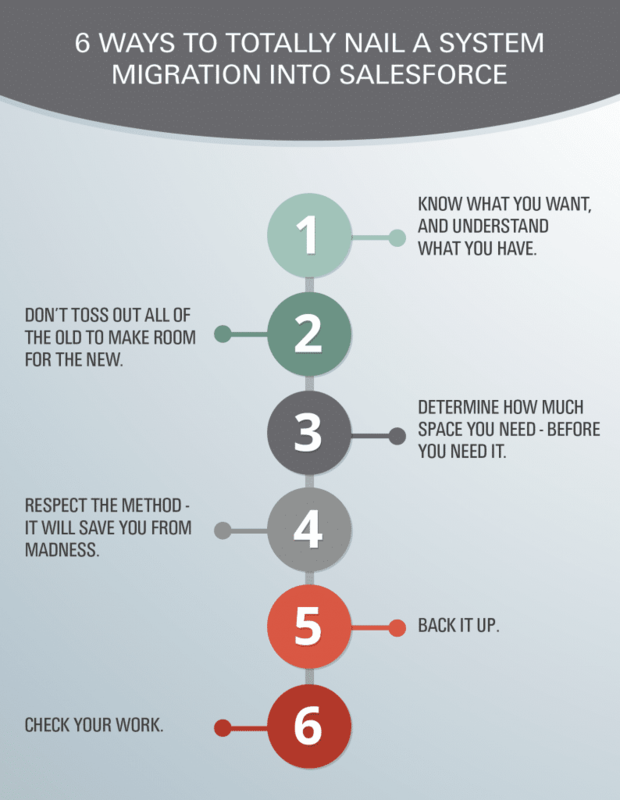 By contrast, if your business plans include acquisitions or radical growth, you will need more space. Your best bet is to discuss your business scope with a project manager who can offer a realistic perspective on what will work best for your situation and budget. 4. Respect the method—it will save you from madness. Want to know the difference between a migration handled in-house and one handled by a program manager? Hundreds of additional hours in repairing the damage. It is extremely important to migrate standard objects in the appropriate order. For example, you’ll want to import Accounts before Contacts so that the appropriate Account-Contact relationship can be associated properly. Another advantage to involving a project manager is his ability to navigate lesser-known fields for future use. Although fields such as LastModifiedDate and CreatedByDate are typically read-only, it is sometimes necessary to work with Salesforce support to make these editable during a system migration if you’re wanting to port over legacy date information to reflect accurate dates. This feature proves helpful in generating accurate projections or sales lead histories. Otherwise, your history begins when the migration occurred. Before kicking off the data loader (or another manual process to migrate data) take the time to review your workflow and triggers in place. Consider if any, or all, need to be turned off to permit a smooth data load. Then, back it up. My experience shows an estimated 10 to 15 percent of businesses do not back up their data. Typically, migrations run smoothly, but that doesn’t mean they routinely occur without incident. Backing up your data is a wise practice for day-to-day operations, but it’s particularly important when preparing for migration. As you’re finishing your system migration, it is wise to complete some manual testing. For instance, log in as different users and review the same accounts to verify the data is showing as you expect it to, especially if the different users have differing permissions and should see a variance in the account view. After the data loader (migration process) is complete, you need to review your data from a developer standpoint. Take some time to run queries on your data (e.g. # of accounts on X record type) and ensure your apples to apples. Making the decision to migrate to a new system is a huge undertaking, but it is often an anticipated step in business growth. By adhering to these six points, your system migration will have you heading toward continued success—not heading south.